will be the most devastating tree disorder in history. Accidentally imported on shipping crates from China, first discovered in 2002 near Detroit, EAB, Agrilus planipennis Fairmaire, has killed at least 30 million Ash trees since. It officially arrived in the northern and western suburbs of Chicago in 2006. "Tens of thousands of new Ash in Illinois in the last year have been attacked" and most newly-infested areas are in the suburbs of Chicago, said Paul Deizman, Project Coordinator for EAB at the Illinois Department of Agriculture on March 10, 2009. According to Deizman there are probably twice as many infestations than are known, and he believes EAB lurks in the Lake-Cook Road corridor west to where it ends and beyond to Algonquin. He said possibly all or most of the Ash in Golf (Glenview) have been infested or will be soon. "It’s spreading at an exponential rate," he added. In February 2009 Clanton Tree Company made Freedom of Information (FOI) requests of certain North Shore municipalities of Ash trees newly infested since a year ago and received these figures: Evanston, 1312; Wilmette, 495; and Skokie, 187. Skokie only has figures for EAB on public trees and Evanston was still counting. These numbers are only for what is new and known. Emerald Ash Borer (EAB) was found in April 2009 in Lake Forest and near Round Lake Beach in 2008. It was discovered in 2008 in Algonquin, Aurora, Burr Ridge, Carol Stream, Chicago, Geneva, Glen Ellyn, Glendale Heights, Golf, Kenilworth, Naperville, Oak Park, St. Charles and River Forest. Golf, west of Edens Expressway, has been hit hard and more has been found west of Edens in Glenview and Wilmette. These discoveries are in addition to the 15 or so suburbs where it was found in 2006 and 2007. Clearly EAB is spreading geographically and exploding in numbers. Of over 1,000 Ash trees under care by Clanton Tree Company for EAB, only 11 are known to be infested, and not coincidentally were probably infested before treatment began. (Early-stage infestation is nearly impossible to detect.) These 11 trees have or will receive special trunk-injection treatment, expected to eradicate the EAB without further damage. Most Clanton’s Ash trees have been protected with ground-injected imidacloprid, which is very effective as a preventive protocol if done amply. As of 2008, Clanton Tree Company began trunk-injecting a newly-approved insecticide named Tree-age, which has an astonishing eradication and prevention record for EAB. Forester for Lake Forest at an EAB nuisance hearing in 2006. Debate as to whether insecticidal control of Emerald Ash Borer (EAB) is effective is over: it is and always has been when done properly and timely. Any doubt about this all-important issue has finally passed as a regrettable episode of misinformation. After years of statements to the contrary, the Village of Wilmette Forestry Department is now quietly advising property owners to consider treatment of their Ash trees for EAB with insecticide if the tree is healthy and worthy. Wilmette now has a form for treatment of EAB on parkways. Morton Arboretum began treating their Ash collection with ground-injected imidacloprid last fall for EAB. The City of Chicago is revising a 2008 plan to treat 80,000 parkway Ash trees. The Ash trees at Margaret Rogers Park in Inverness are under treatment by Clanton Tree Company, as are more than 1,000 on private properties in the Chicago suburbs last season. 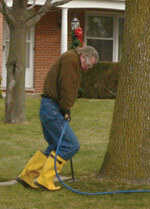 To spare an infested Ash from removal, the City of Evanston requires an insecticidal treatment. St. Charles in March recommended homeowners to consider insecticidal control. In April, the City of Lake Forest announced discovery of EAB on more than 20 Ash trees. The Chicago Tribune reported a tentative plan to remove 7,000 Ash on the parkways in that suburb, but city forester Peter Gordon said in May many of the most valuable Ash will be treated and advises homeowners to "work with your arborist and choose the right product (insecticide)" to control EAB. Tom Cahill, forester for Lake Bluff, believes "it’s probably already in town (Lake Bluff)." Once inside an Ash, EAB larvae will typically kill or damage the tree irreparably within three or four years. EAB is best prevented but can be eradicated within a tree with more effort. Recent research from Michigan State University claims treatments need not be as comprehensive or frequent after five years of initial infestation of a neighborhood because most Ash will be dead and EAB will have largely moved on. The insecticide imidacloprid is especially safe and reliable used as a soil-injection for prevention of EAB. Through the roots the imidacloprid is translocated systemically throughout the canopy of the tree. There are many seemingly minor variances as to how application is made that have great impact on efficacy. Imidacloprid soil injections will also kill early-stage infestations. 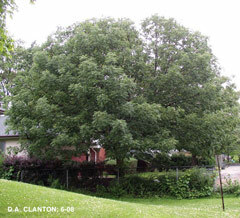 Ash trees smaller than 24" Diameter at Breast Height (DBH) need full-dose injections once annually to establish and maintain a repellant residual level of imidacloprid within the tree; larger than 24" need two full-dose injections annually in heavily infested neighborhoods. Soil-injections with imidacloprid cause no damage to the tree. The Detroit suburb of Grosse Pointe Woods has been treating the parkway Ash since 2001 with imidacloprid. While millions of Ash in the nearby metropolitan area have been destroyed by EAB, Grosse Pointe has lost only two of 650 Ash. Tree-age (emamectin benzoate) is a new, longer-lasting and quicker-killing insecticide administered through injection holes in the trunk near the ground. It has a proven 99% kill-rate of established infestations within weeks of injection and a 100% prevention rate for un-infested Ash. These levels of control are possible only if the tree is healthy and application is done correctly. Clanton Tree Company doses Tree-age at the highest prescribed level to achieve three-year instead of the standard two-year control. It is an appropriate and more costly option that spares a tree from any more drilling than necessary. It is unnecessary to administer Tree-age more than once every three years. Three-year dosing is more expensive and considerably time-consuming to administer, but a more responsible option. If cost was the only consideration necessary to decide which insecticide to use to control EAB, trunk-injected Tree-age would be the choice for almost all situations. Although drilling a tree to deliver certain substances into its system is an accepted practice in arboriculture, it should be done only when necessary, and no more often. 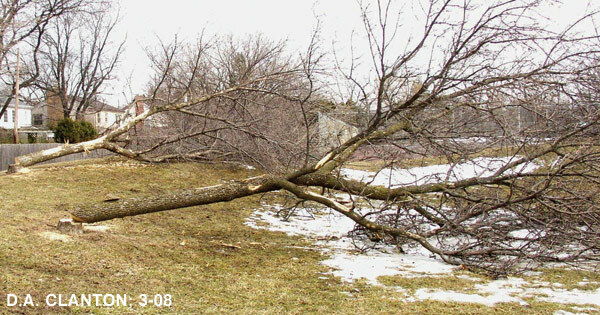 Trunk injection with Tree-age causes damage that is inconsequential to most trees, but may cause injury from which older trees have difficulty recovering. In the situation of an infested Ash, or in a heavily-infested neighborhood where infestation of EAB is imminent, there is a compelling reason to trunk-inject Tree-age. Trunk-injections with Tree-age take effect within days to weeks and will kill EAB larvae upon contact within the tree. Ground-injected imidacloprid is safe and works extremely well when done preventively and applied amply. It is the favored method for control of EAB under most circumstances. All indigenous American ash varieties are vulnerable to attack by EAB. Mountain Ash, Sorbus, is not endangered because it is not a true Ash, or Fraxinus. Imidacloprid and emamectin benzoate (Tree-age) insecticides are used either as ground or trunk injections, sparing the neighborhood atmosphere flying droplets or vapors. Clanton-treated Ash in 2008 next to Lovelace Park , Evanston. Click the photo to enlarge. All 73 Ash in Lovelace Park were destroyed by EAB. Click the photo to enlarge. One in five trees in Chicagoland is an Ash. 2,901 red flags are Ash destroyed by EAB since 2007. Green are healthy, Clanton-treated Ash. EAB is "insidious" and difficult to detect in early stages, but has most certainly spread throughout the northern and western suburbs. 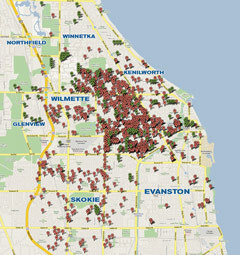 2006 Known EAB Locations in Winnetka, Wilmette & Evanston.